Click the button below to add the Castilla by Albéniz/Babak to your wish list. 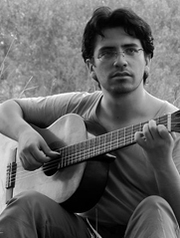 Babak Rostami started playing guitar when he was a teenager. As a solo performer, Mr. Rostami turned his abilities and talents to chamber music; he is a founding member of the Cedar Guitar Quartet. As a founding member of this illustrious guitar quartet, Mr. Rostami has taken the art of quartet arranging to its highest level. Seconda Prattica is thrilled to offer his substantial arrangement of Rossini's - The Barber of Saville for guitar quartet. Mr. Rostami holds a degree in composition. He has had guitar lessons with Maestro Nikita Koshkin and Dr.Lily Afshar. Besides maintaining his busy schedule of performing, composing, arranging, and commitments with the Cedar Guitar Quartet; he also maintains a large private studio.